There has been some push back against the Government’s light rail proposal for Dominion Road from some unlikely sources. Councillor Mike Lee, former NZ First candidate and public transport enthusiast Jon Reeves and others have formed a new organisation NZ Transport 2050 Incorporated to advocate for the Puhinui spur, a rail line that will link the Airport to the Southern line. There are people involved in this group who have taken a long term interest in public transport and who have been effective advocates for change. At a public meeting last night, the Public Transport Users Association and NZ Transport 2050 said the government had got it wrong. In April the government and Auckland Council released the details of a $30 billion plan for transport in the city. It allocated an initial $1.8bn for a light rail network for trams connecting the city and Auckland Airport. The Transport Agency, which is leading the development of the light rail, said the route and total cost will be released later this year. Paul Miller of NZ Transport 2050 said the trams should be ditched in favour of trains to and from the airport. Mr Miller said Auckland desperately needed to focus on building infrastructure that would grow with a fast-growing city. “Anyone that’s been down the south western motorway near the airport in Wiri would know that it’s pretty much all grassland between there and the actual airport itself – a distance of about six and a half kilometres. “We’re saying that that should be a track with heavy rail tracks and linked up to the main line,” Mr Miller said. Simon Wilson analysed the claims in this articlepublished last Friday. The Puhinui advocates have preferred to stress that their proposal offers the quickest route from downtown to the airport and would also be good for freight haulage. Both those points have merit. But the advocates also say we should build the spur instead of running trams from the inner city through Mt Roskill to Mangere. That does seem to miss the point about trams. Forget for the moment the air travellers. Think instead of modern transit vehicles, each with a capacity 10 times greater than a bus. Running down the middle of the road every five minutes in both directions. Going slow in the inner city and on Dominion Rd but fast once they get to the motorway at Onehunga. They’ll go all the way to the airport so, yes, they will offer an airport transport option. But that’s the least of their roles. 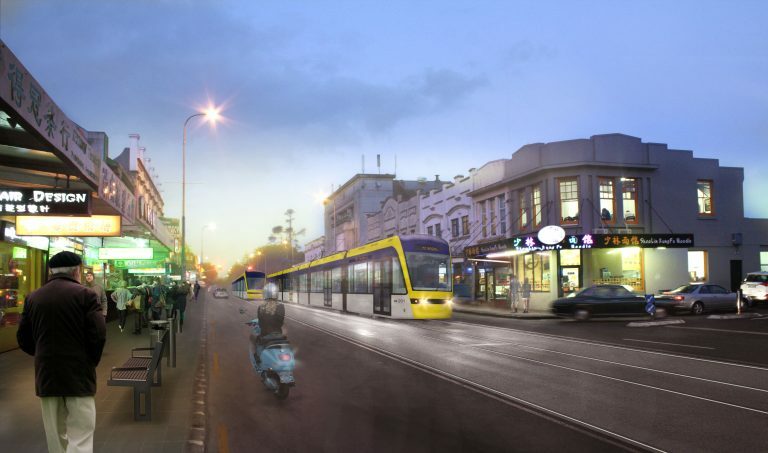 They will provide everyone living on their route with a frequent and reliable commuter transport service, which will take both buses and private vehicles off the roads, easing the mounting traffic crisis on Dominion Rd. Other benefits: fewer cars means less air pollution at ground level and fewer greenhouse gases; fewer cars means safer streets. Those trams will replace many of the buses that currently choke up Symonds St, Britomart and Victoria St East, thus freeing up capacity to allow more buses into the CBD from elsewhere in the city. This is one of the most-overlooked benefits of the new tram lines: they will help build public transport capacity not just along their own routes, but everywhere it’s most needed. And at Greater AucklandMatt L agrees with Wilson’s reasoning. [I]f you compare a Puhinui spur with light rail, you get a bit of a win for people travelling between the city centre and the Airport, but at a huge loss for everyone else. Instead of helping to fix many of Auckland’s most significant transport and housing problems, you get a line that’s probably going to be mainly used by international tourists and business travellers. That doesn’t make any sense to us, which is why we much prefer what’s outlined in ATAP and our Congestion Free Network: a light-rail link from the north and a bus rapid transit connection from the east. I also agree with Wilson. The light rail proposal is much more than just dealing with airport requirements. It will improve public transport to a significant part of Auckland. And eventually, once the construction disruption has ceased, Dominion Road will be a far superior place, able to be accessed with ease and devoid of the current car congestion that is a blight on the area. Twyford’s proposal is brave and will no doubt cause considerable local opposition. But if we want to fix our city and convert it into a properly functioning 21st century city then this is the sort of project that will have to be proceeded with. I have yet to see any details of the qualifications and experience of the “expert” who Auckland 2050 had speaking at their Dominion Rd meeting. My attempts to ask Mr Reeves were met with prevariaction and evasion. No transport expert addressed the meeting and a busway or light rail would give a similar outcome to a heavy rail spur.